Extending our classroom to the world! How to decrease chances of a project failure? There is nothing more rewarding for a project manager than a successful completion of a project. There are many factors that contribute to such an outcome. Successful projects need to be well planed, managed and executed and each of those phases has to be carefully prepared, implemented, and performed. If everything goes according to your plans, great… mission accomplished, but what if things turn up side down? As a project manager you may encounter situations when some of the projects you were involved or led did not return the outcome you had expected. Sometimes, although you think that every aspect of the project has been thoroughly analyzed and prepared, the overall project outcome is a failure. You start to think where the mistake has happened? What was missing or omitted? One of the most common reasons for the project failure is actually inexperienced project manager(s). In many situations, managers work under stress. Do they know how to handle it? Can they well understand and make right financial decisions? Can they run appropriate negotiations, solve unexpected issues, communicate required information to appropriate project group? Although it may sound ease, some especially young projects managers, may have problems with stress management and poorly perform under such situation. In critical moments, they may loose the objectivity and start to use false assumptions or just start to force things through. Another common reason for a project failure may be lack of resources. To successfully complete any project the appropriate resources such as personnel, equipment, tools, etc. need to be provided. Project resources are key to achieve the project’s goal. What is going to happen when we promise the project delivery on certain time with limited or inadequate (skillset) resources? How that goal can be achieved? Without required resources, the project delivery will be delayed, poorly completed, or completely fail. Often, to save money on the project, managers try to deliver the product on the minimum resources involved. In many occasions that saving turn out to bring more expense at the end than expected. Poorly defined requirements are very well known reason for the project failure too. It is very important to clearly document what are customer’s expects and needs. It is crucial for any project to make sure that both sides of the contract understand the requirements. Additionally we need to make sure that those requirements are agreed to and signed off by the client before the project implementation phase. What would happen, if there were a situation in which the customer expects something different than what we believe they want? What would happen if we started to implement the project, which was never approved and consigned by our customer? Have you ever experienced a project failure? What was the cause of it? If not, what in your opinion are other reasons for the project failure? We have all been there or at least read about it. Firms stating they are going to hire this many thousands of employees over the next few years. Firms predicting an uptick in the market and hiring in advance to be able to meet demands with a mature workforce. The fallout of the mass hiring is usually those employees sit stagnant for quite a few months until they are properly trained or certain workstreams sell. 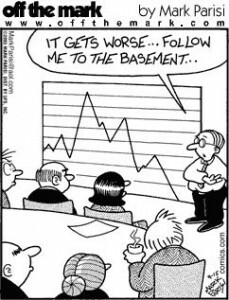 Being in consulting I have seen this firsthand. My firm staffed-up considerably in my area of focus with some of the new employees not place on engagements for up to eight months. While they are participating in internal activities they are not billing hours to the client, thus are a negative investment for the firm. Thus the concept of leadership’s involvement in recruiting, productivity, and retention. Bringing in top talent, putting that talent to use, and keeping that talent in house for years to come should be the goals of management. However, it seems like no matter how well run an organization is, these issues are all still prevalent. Great leaders should focus on utlizing the current talent they have in house rather than hiring from the outside. There are numerous pros to this line of thinking including the expense of bringing in new talent, the expense of losing current talent, and keeping employees engaged. Do you have experience where staff was utilized rather than hiring additional employees? Have you seen instances where employees where cross-trained over different disciplines in order to increase productivity? The assigned objective was to create, plan and execute a fund raising project for a designated charity. 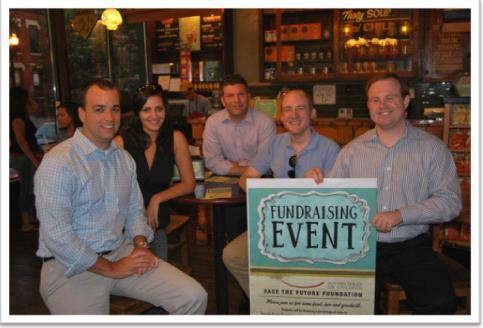 Our team chose to support the Face The Future Foundation (FTFF). FTFF is a non-profit organization supporting the University of Illinois Craniofacial Center. The Craniofacial Center is one of the oldest and largest facilities in the world dedicated to the treatment of infants, children, adolescents and adults with cleft lip and palate and other congenital craniofacial conditions. Our team partnered with Potbelly Sandwich Works, specifically the store located at 1459 W. Taylor Street. This location is steps away from the UIC campus and the Craniofacial Center. Potbelly pledged to donate 25% of sales during one evening’s dinner service (5-8pm). The event was held on Thursday, August 2. Our team recruited friends, FTFF board members and Craniofacial Center staff to attend the event. Team members offered free shakes to entice people on the street to attend the event and learn more about FTFF. Our team chose to partner with these organizations because of existing relationships. Kacie is a member of the FTFF junior board. Kacie’s relationship facilitated faster and more effective communication with FTFF. Dan works for Potbelly in the marketing department. 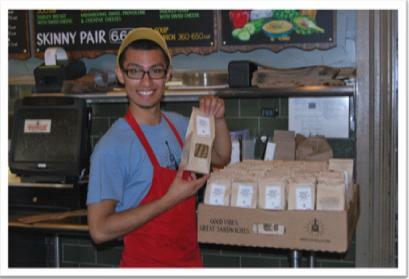 Dan leveraged Potbelly’s promotional resources and communicated with store leadership. In addition to holding the Potbelly event, our team sought to leverage our personal and professional networks to raise funds. 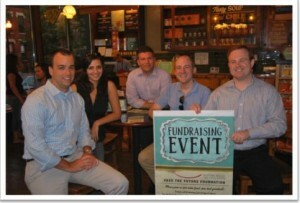 Team members used word-of-mouth, email and social media to drive people to the FTFF website to donate. Several team members sold Potbelly cookies to co-workers, family and friends. One team member held a company-sponsored “Wear Your Jeans to Work Day” to raise funds. Our team raised $2,588.75, more than any other group in the class. Our team initially projected $200 as our fund-raising goal. However, that amount was solely revenue from Potbelly. After adding donations, we revised our goal to $1,000. We were able to far exceed our goal. We also were able to spread awareness of FTFF to hundreds of individual we touched in our campaign. In our initial proposal, we estimated we would raise $212.50 through our partnership with Potbelly. Our actual total was $251.75, an 18% increase over the estimated total. It is clear that our event drove additional traffic to the Potbelly. We were able to bring more than 15 friends and co-workers to the event. 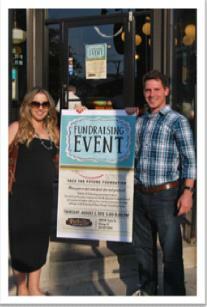 Potbelly was very happy with our event, their first fund raiser. Make sure you follow your plans and do not lose sight of your objectives. Our team did not use our implementation plan well enough. We each took our own assigned tasks and completed the tasks, but did not integrate our tasks into the larger project or interface with other team members enough. We would also recommend appointing a true project manager to facilitate collaboration and communication. Because of the size of our team, certain messages were not communicated uniformly or well enough. Irini blogged about the value of a communication plan – your team may benefit from that exercise. Test everything! Be prepared for technology challenges! One challenge we faced was the FTFF website. The website was difficult to navigate for some users. This led to frustrated people not able to donate and a lot of last minute headaches for the team. This problem was not on our risk management plan and we did not anticipate this issue. In retrospect, our team should have thought this through as technology issues are common. We should have tested the website in advance. Beware of scope creep. Given that our team had 7 members, we needed to raise a substantial amount of money for this project to be successful. 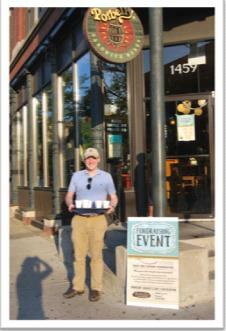 Our team needed to raise funds beyond the $251.75 generated by Potbelly. However, as we added new branches to our fund raising plan (cookie sales, online donations, day-of cash donations, work sponsored event) it was difficult to manage everything. Our team lost sight of the initial objective to some degree and it was difficult to be on top of everything. More is not always merrier. It was clear that this project could have been managed with fewer people. The extra people allowed our team to raise an impressive $2,588.75. However, the project could have been managed more effectively. Our team attempted to divide the project tasks evenly, but this was not possible and not efficient. Rather than have one person handle a task well, in some cases, we divided the task further and allocated the work to two people. The result was not cohesive. Pop quiz: What type of bar crawl has no alcohol, no bars and no attendees? If you answered a terrible bar crawl that you would never attend, that’s true. However the answer for our project team turned out to be a virtual food drive that raised over $1000 for the Northern Illinois Food Bank. Confused yet? We’ll explain. Our project team started as an attempt to raise money for Growing Power’s Iron Street Urban Farm, a 7 acre site on Chicago’s south side that produces healthy, sustainable food year-round. http://www.ironstreetfarm.com/ The team’s original plan was to hold a bar crawl on the city’s north side, targeting fellow DePaul students and combining a fun event with an opportunity to raise money and awareness for a local organization. The curveball came when our team was informed that a bar crawl might not be the best representation of DePaul to the community, and we were faced with our first challenge to change course. The good news is that we had not yet invested any money into the project, but the bad news was that we had already invested time and effort into kick starting an ambitious project. To further complicate matters, we lost a team member with significant marketing and graphic skills along the way to another team. Not exactly an auspicious start. So like any project team, we were forced to deal with the challenges encountered. In our favor was the fact that each team member had already presented an idea for a charity event, so we had three alternates ready to review. We selected the Northern Illinois Food Bank (NIFB) http://solvehungertoday.org/ as our charity, which turned out to be an excellent choice for reasons we’ll detail later. At the beginning though, this decision had its own set of challenges. The team had wanted to hold a physical food drive in addition to a virtual drive, while promoting the food drive throughout the entire Chicago area. Once again we encountered roadblocks, with NIFB requiring team members to drive hours west to pick up physical food drive boxes while limiting our team to promoting the event within Lake County, Illinois, to avoid territory conflicts with the Chicago food charities. Yes, that’s right. We almost got into a food drive turf war! Who knew? In some respects, it made the project easier by requiring focus and targeted effort on the virtual food drive only. More importantly, the NIFB more than made up for the restrictions by supplying a ready-made, interactive website with unique links for our DePaul Kellstadt food drive. The team decided to shoot for a goal of $1,000 based on input from the NIFB on previous food drives, and we went to work putting out the word. Marketing efforts included sending out emails and flyers, as well as Facebook and Twitter messages. The team also solicited donations personally, reaching out to family, friends and coworkers. With all the drama aside, and our team focused on leveraging our social and personal networks, the project turned out to be a clear success. The end results were netted $1,165 in donations over a 3 week span, with an average donation of $40. Even more impressive is what the Northern Illinois Food Bank can do with that money. With their buying power and distribution network, the NIFB is able to create 6 meals out of every single dollar donated. Don’t worry, we’ll do the math for you – that equates to 6,990 meals for our neighbors in northern Illinois! Considering where the team started, we felt proud to have contributed to our community at that level. In the process, we learned quite a bit about the effort it takes to put on a charity event. First and foremost, the next time you’re out at a bar event or get an email asking for a donation, keep in mind how much work really goes into the process and consider giving, even just a few bucks. If you want to embark on your own charity event project, we would advise you to vet the chosen charity carefully. Issues seen in our selection process or by other teams included willingness to communicate and support the event by the charity. It may seem counterintuitive that a charity doesn’t want your help raising money, but in reality they only have so many volunteers or staff available to work with different teams. Also watch out for charities that may ignite controversy or are not well known. This isn’t to say they should be avoided, but just realize more effort will be required to get the results. Our team could not have asked for a better partner than the Northern Illinois Food Bank – communicative, supportive, web-enabled, flexible, fast acting – you name it, and it made all the difference. That brings us to a clear lesson learned – be careful when leveraging your personal or social networks. We all have “that friend” that constantly sends links to charities and events and who-knows-what. This charity drive worked in part because our team had members that could approach their family and friends with a request for donation. People are bombarded daily with ads and requests of all types, so teams need to realize that generic, mass mailings are likely to be overlooked. Targeted, focused and most important, personal requests for donations were very effective for us. Taking it all in, clearly project teams need to be willing and ready to adapt to change. Our charity changed, our event changed, our team changed, our approach changed – you get the picture. And unfortunately, this is not a rare occurrence when it comes to projects. As usual, the only guarantee is that something significant will change. You can’t control everything, so when things change around you, respond in kind quickly and thoughtfully. Then once those items have changed, realized that assumptions made previously may no longer be valid. Everything in your project has to be on the table; be prepared to recast your movie, change the script, the set location and sometimes the plot. And that, is how a bar crawl with no people, no bars and no attendees was a resounding success. What’s your best meandering path project? How different have your outcomes been from original estimates? 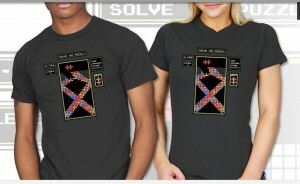 For our charity event, our team decided to partner with the web-based business riptapparel.com to do a one day t-shirt sale, with $3 of every $10 shirt sale going to Autism Speaks. Ript Apparel’s business model is that they sell a different shirt every day, and the shirt is only available for 24 hours then it will never be available again. Independent artists are able to submit their designs to Ript Apparel, who have the final decision on which shirts go on sale. If their design is selected, the artists are paid $1 for each shirt sold. Additionally, Ript Apparel doesn’t print the t-shirts until they are ordered, so they are never stuck with excess inventory. The advantages of our project were that the website and infrastructure were already in place, and that Ript Apparel already has an existing customer base and a mailing list of around 12,000 people to whom they can send an e-mail blast when needed. For our team, that meant that the major tasks we needed to focus on were creating the t-shirt design, negotiating a donation percentage with Ript Apparel and the artist, and doing additional marketing activities to drive sales. We also created a link from the Ript Apparel website to a direct donations page we created, to give customers the opportunity to make a more sizable donation. At the outset, our team was projecting to raise $1,450 for our charity, with $2,900 being the high and $675 being the low. Our final total raised was $1,027. Coming in under our projection was disappointing, but we faced some unexpected adversity the day of the sale, when there was a revolt on our message board with people speaking out against our charity and encouraging people not to buy the t-shirt. Among others, there was a post that compared Autism Speaks to a well-know hate group, and another that made it a point to describe them as an evil organization. Since the sale was only for one day, it was difficult for us to counteract this and develop any positive PR. Considering the unexpected circumstances, we feel that the amount we raised from our project was ultimately a success. The project was also successful as a learning experience, as the team faced numerous obstacles and schedule changes over the 2 months and learned to adapt on the fly, applying some of the concepts we learned in class to help us. For teams doing this project in the future, some advice would be to keep the project simple, especially if you are doing it in the summer where you only have 6 weeks to accomplish everything. Another word of advice is to keep the team size small. We ran into some difficulties with communication between five people, and imagine it would be worse with additional team members. Finally, choose your charity carefully. There are a ton of controversial charities out there, and by picking a neutral charity you can avoid some of the backlash that our team experienced on the website. One lesson that the team learned is to consider the public’s perception of a project. Even if you think you are doing the right thing, seeing it through the lens of an outsider could reveal some problems that you don’t see internally. Another lesson is to clearly define roles at the beginning of the project, and have one person take the lead rather than everyone trying to contribute equally. Finally, consider all the possible risks, not just those that are likely to occur, and have a contingency plan for all of them. CCRF is a small shelter located in the city of Chicago with a goal of finding permanent homes for both dogs and cats. CCRF assists animals that are slated for euthanasia and takes in animals from kill-shelters across the Midwest. We decided to focus on this organization because of the strong interest working with an animal shelter in the city by a majority of the group. Additionally, one of the group members had adopted dogs from CCRF in the past and the organization was the least funded out of the few options that were being decided upon. 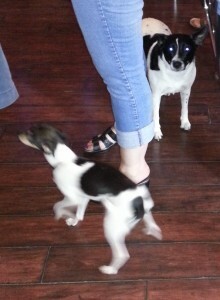 The event we intended to host was a social event in a pet-friendly establishment called Grace St. Tap. Another group member was an acquaintance with one of the formers owners who was still actively involved with the bar. Dogs were allowed inside this establishment making it an ideal place for attendees to network with other pet owners and DePaul students. The end goal of the event was to raise money for CCRF through tickets to gain entrance to the event, tickets for a raffle held during the event, as well as direct donations through CCRF’s website. At the outset of the project, once Grace St. Tap was chosen as the venue, we projected a best case, worst case, and most likely scenario of $1,000, $500, and $700, respectively. The event was successful in regards to attendance. Grace St. 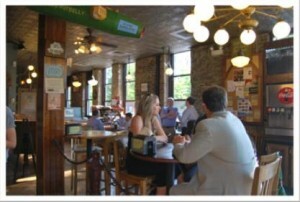 Tap is fairly small with a maximum capacity of approximately 50 people. We were marketing the event with intentions of having between 30 and 40 people attending specifically because of those limitations. However, with 35 people and 12 dogs in attendance, Grace St. was comfortably busy and a significant increase in either people or pets would have made the environment less conducive to networking. The tickets, the raffle, and direct donations amounted to $998.95 which just barely missed our best case scenario of $1,000 in donations. In regards to an overall analysis of our project we were successful in our objective of raising funds for CCRF with achievements just short of our best case scenario. Breaking it down further, we had individual successes at the project management level through our human resource placement, planning, and teamwork. We had team members placed with tasks that suited their skills; members in sales/customer service helped market and solicit the event, we had someone with a connection to CCRF and another individual with a connection to Grace St. Tap, and someone with strong project management skills who led the team. Likewise, we placed an emphasis on preparations for the event itself with plans to handle the various situations that could arise with a large number of dogs, etc. Finally, we have been part of DePaul’s weekend MBA project for approximately two years so everyone was familiar with each other and trust/timing on various tasks was never a concern. On the opposite end from effective project management, the main issues we faced was marketing within a compressed timeline and managing the ticket sales due to walk-in attendees. We choose a date for the event that was about a month from when the project was introduced. By the time we had everything in place with the event, we had about 1 to 2 weeks to advertise. This was due to confirming we could host the event at Grace St. Tap on our selected date and having CCRF agree with the flyer we were using. Also, CCRF is very small organization with only one individual in charge of their website. That individual was finally able to post our flyer and information on the event about a week before it was to occur. In regards to managing ticket sales, we were restricted with the small size of the establishment and the ability to buy tickets at the door. As a team we decided in advance to use a website that allowed people to buy tickets in advance and print the ticket to bring to the event. This allowed us to track the expected volume up to the day of the event. However, we really did not know how many people would show up with a ticket purchased in advance. So, we had to limit our marketing and advertisement of the event. If we had an additional 40 people show up the day of, the venue would not have been able to hold everyone and we would have to turn some away. So we mainly relied on using Facebook and LinkedIn to network to our specific social networks. However, we did have a flyer created to hang up at pet stores, dog parks, vet clinics, etc. ; but we limited the total number we ended up posting. Our main advice to a team interested in hosting a similar event would be to really focus on the timeline you have to work with and the marketing plan. If you have a month to work with, the overall scope and expectations of your project need to be realistic. For example, our best case scenario could have been doubled if we had multiple months to plan and prepare. We would have needed to choose a larger venue, but we could have also advertised the event on a much larger scale. This advice goes hand-in-hand with our take-a-ways from the project. First off, it is important to know your team and their strengths/weaknesses. It is much easier to work on a project where you have past experience with all past team members. This was especially important with a project that had a very tight deadline. Also, each individual’s social network is vastly important to the success such as the one we hosted at Grace St. Tap. A large percentage of the attendees were directly attributable to the social network of someone on the team. You can always really on your network to either attendee the event, make a donation in this case, or continue to spread the word and promote the event. Finally, always look for pre-existing solutions. You don’t always have to “reinvent the wheel” and that may not even be an option depending on the timeline. An example of this is through our use of EventBrite to monitor pre-sale tickets. Eventbrite allowed us to monitor the number of people we were expecting to attend the event. Through the site we could determine how much additional promotion were necessary, either through distributing more flyers or additional postings on social media. Instead of not having pre-sale tickets and hosting the event without any idea on the number of guests, the use of EventBrite removed the unknowns of either very low or very high attendance numbers. PMBOK and PMI have long focused on traditional project management techniques – developing work breakdown structures, linking tasks to build a network, estimating effort, assigning resources, levling, scheduling, forward passes, backward passes, slack etc. etc. etc. This stuff works, no doubt about it, but it works best for projects not many of us really work on in the corporate world. Traditional project management requires that the practictioners and stakeholders have the right level of expert knowledge and understanding. For example to build a WBS to build a sky scraper, with sufficient detail to ensure all required and ancillary tasks are identified, requires someone who has built a skyscraper before, and probably a bunch of experts that know about construction, architecture, logistics, politics etc. Many of us may never really work on such a project. In the corporate world, a lot of the projects you are faced with are implementing something new and unique. Even software development projects tend to be unique due to the speed of technology change. Building a WBS structure and spending a bunch of time upfront building a comprehensive task list may not be realistic, as tasks aren’t quite clear as to what needs to happen down the road. Agile Project Management (also known as Agile Scrum Methodology) is an excellent choice for managing projects that have rapid time frames or unclear requirements. Under Agile, the methodology is very simple – communicate often, don’t let planning get in the way of doing, and give the experts the power, not the management. A team would define a short period of time to execute on tasks, called a sprint – typically one to two weeks. The team spends time talking everyday to build the list of tasks to accomplish during the sprint. Within the team there are very clear roles of who is accountable for requirements and approval of work (the product owner) and those actually doing the work. All other stakeholders (managers, end users, political influencers) take non-speaking roles, requiring all communication through the product owner. I would recommend that everyone spend a bit more time learning about Agile project managment – while considered a software development process, it is a great tool to have in your toolkit and readily adaptable to several project scenarios. The internet, smart phones and email have all turned the normal work hours of 9AM to 5PM, Monday through Friday into a thing of the past. Workers are connected all the time every day of the week. These communication tools have also made operating in a global market place significantly easier. When workers in the US are sleeping, workers in Asia are busy sending emails. Time to respond and working in a global environment has become a very precious commodity. With limited time available people are looking to become as efficient as possible while at the workplace. Each day a person’s schedule is probably filled with email, phone calls, and a number of face to face meetings. It is with a new app called Twist that serial investor Bill Lee is looking to ensure that no one is wasting any time prior to the start of these face to face meetings. Twist identifies which people are going to attend a meeting and notifies them via text message if you are going to be late. Bill came up with the idea last year after holding 200 meetings at a San Francisco hotel. A number of participants were late causing meeting attendees to spend time tracking down participants. Now with notification meeting attendees can use the extra time in their prior meetings or for other tasks. Twist works by combining real time traffic data with the traveling tendencies of each individual app user. It was important to capture the speed of the user, whether lead footed or not, in order to provide an accurate time of arrival. The app will automatically send a message if it determines that you will likely be late to your next meeting. The text message will provide an estimated time of arrival and also a map where participants can see your current location. A final text will arrive when the person is within one minute of arriving. For CEO Bill Lee this is the first step in his vision for Twist. He wants to be able to further develop the app so that each meeting can provide you with the exact time needed to arrive since 20 percent of the U.S. population is late to meetings. He has pointed out that 38 percent of late arrivals can be attributed to underestimating the travel time needed and 53 percent is due to traffic. This app is an important step forward in using technology to make the work day more efficient. All workers try to manage their time, but this helps to pull in outside information like traffic data to make Twist notifications as informed as possible. This way when we do still need to meet face to face these meetings happen on time. After Saturday’s class and the teams’ status reports, I found myself reflecting on my team’s project status with an increased critical eye. I found myself pondering about how our simple Face the Future Foundation and Potbelly’s event grew to the event, a cookie sale, and an office jeans day; while most teams, if not all, are just putting on an event. Talk about scope creep! Our project nearly tripled in tasks when the additional ideas were added. In most situations, scope creep can be horrible to a project; however, our scope increased by design and our group had control of the scope at all times. While you read this you may think I sound like I am justifying what our group decided, but I stand by my opinion that we allowed the scope to increase due to one important fact: team size. Our team is comprised of seven team members when the average team size of the other groups is five. At the beginning of the project, I was excited about having the extra hands and minds to accomplish the event; however, I now know that my excitement was a rookie thought that was quickly replaced with the knowledge that an increased team size does not always equal more success. The large team has been great so far except for the simple fact that because our team number grew to seven, our performance expectations also grew. Therefore, our group decided that we needed to work at guaranteeing a higher amount of donations. Not wanting to put all of our eggs into one basket, we decided to branch out and add more components to our fundraising event. Ipso facto: a cookie sale and an office jeans day. With the decision to increase the scope of the project, our team is attempting to mitigate the risk of a low donation amount as well as increase chances of success. Sounds too good to be true, right? Well, hopefully not. At this point, we have not had any major adverse effects from having a large project team besides having to increase our project’s scope. We have not experienced the ‘too many cooks in the kitchen’ phenomena, major conflicting ideas, or excessive communication issues. Even thought, like most teams, we have experienced some unexpected obstacles, all in all the project has been running fairly smoothly. I am confident our team has done everything in our power to set up our event(s) for success. However, the final piece of the puzzle is the obvious concern of every group: hoping people show up. With all that said, has anyone experienced scope creep causing negative implications on a project? Or has anyone been on an excessively large project team causing adverse outcomes? Beauty Is In the Eye Of the Bear-Holder!